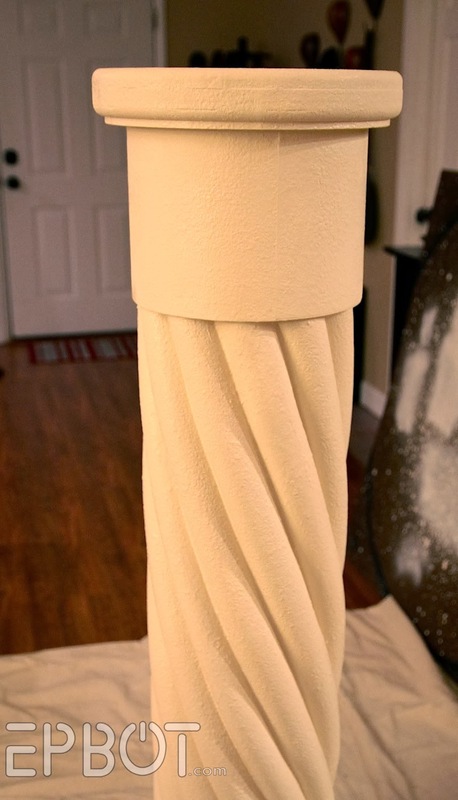 EPBOT: Make Your Own "Stone" Decorative Column... With Pool Noodles! 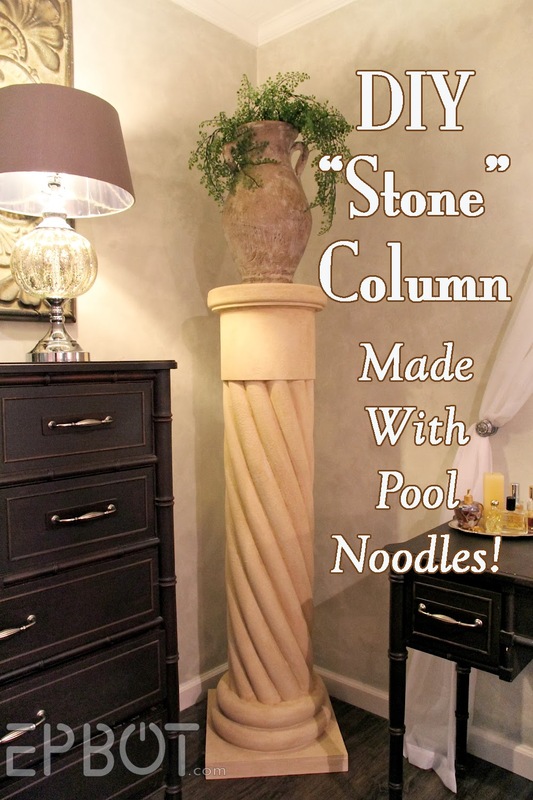 Make Your Own "Stone" Decorative Column... With Pool Noodles! It was a joke, of course, because those columns cost between $500 and $600 each. YeeeeahNO. John took a good long look at that photo, though, and said, "I could make one of those for $50." 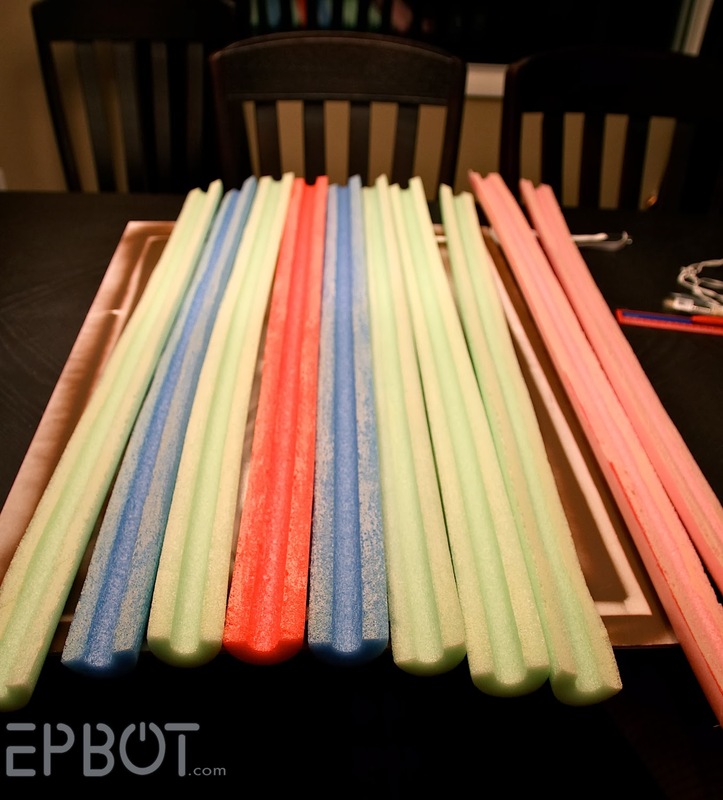 John's initial design involved routing a lot of tiny wooden trim pieces, but then I had a brainstorm - and convinced him to try using pool noodles. You heard me, pool noodles. 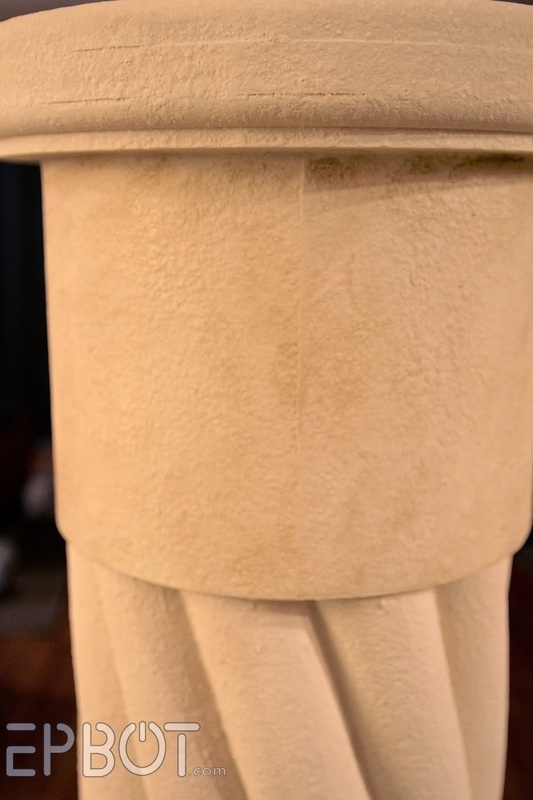 Obviously we weren't trying to match the RH columns exactly; I decided to go for more of a clean-cut stone or plaster look instead of distressed wood. Stone is much easier to fake than wood, and besides, you see more stone columns anyway. That's an 8-inch concrete form tube from the hardware store, which costs about $8. The noodles were 70 cents each (on clearance at a dollar store), and we ended up using six of them. Add in a quart of contact cement, some scrap wood, and paint that we already had, and our column ended up costing us more like $20 instead of $50. (Cha-CHING!) Even if you had to buy the wood and other supplies, though, you'd still be well under $50. Don't worry if it's not exact; just do the best you can. You could also lay the noodles out straight, though, if you don't like the spiral look. This was my first time working with contact cement, and it. is. awesome. Once it dries it only sticks to itself, so you don't have to worry about snagging anything you don't want to - but once it sticks, it forms a permanent, ultra-strong bond. The pink noodle was the last one we placed. As you can see, it's a bit smaller from being squished into place, but not terribly noticeable. I rotated the column while John held the Sharpie, supported by a shoebox. See how much taller the new cap makes the column? Oh, and we've already sprayed on our first coat of primer here, too. Use a plastic spray-primer, or a good quality one like XIM. You could also make it square; I just liked it better round on top. 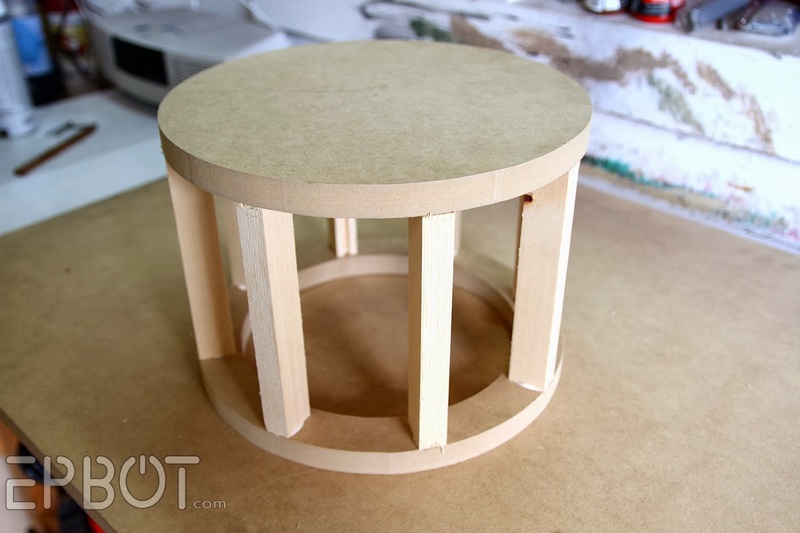 The end result is incredibly sturdy, and with the wood base & cap weighs a good 15 pounds, so don't worry about it tipping over too easily. 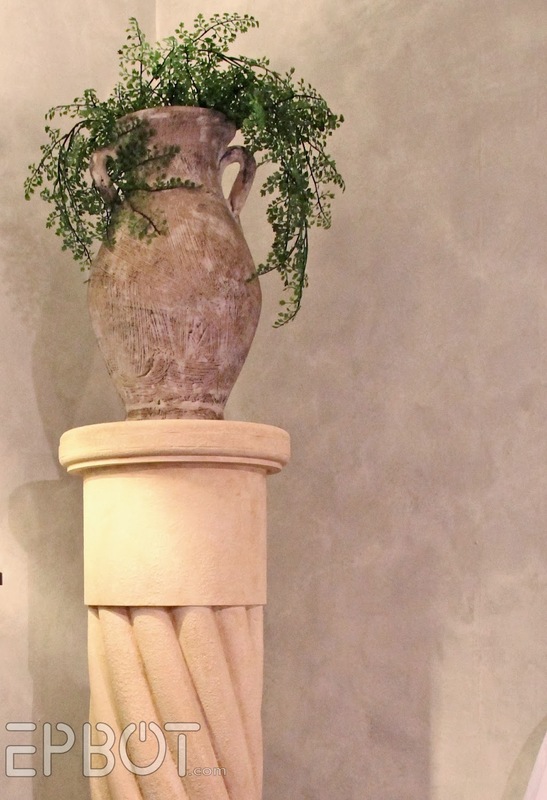 I purposely made the column more of a cream color to contrast with our gray walls. Hope you guys liked our latest project, and that some of you will give it a try! As always, feel free to ask questions in the comments. Now that the holidays are over I have lots of fun household crafts to dive into and share, so stay tuned for more soon! Wow, this is so creative. Awesome! that's the coolest thing I ever saw, you guys know your stuff. 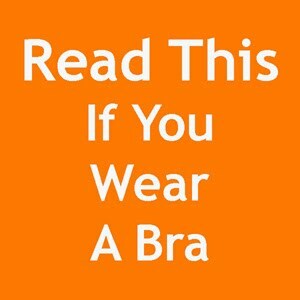 Pinned this because you rock, and more people should see your awesomeness. I am wondering if you might be able to do something similar for an outdoor use- dressing up my porch supports would be much cheaper this way! As long as you seal it really well with an exterior paint, this *should* tolerate an outside overhang or screened porch. Just gotta watch for mold, same as anything outside! Love it-- so clever! 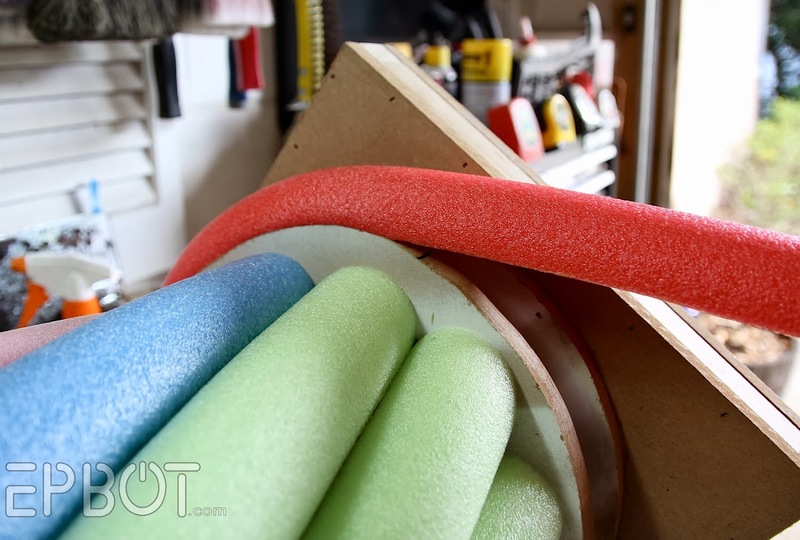 Pipe insulation could also work instead of pool noodles, if one wanted skinnier spirals. Brilliant! That would be perfect for smaller columns, too. oh jen, this is so brilliant! great job! you two rock! such creativeness, awesome! Wow, that is honestly genius. Pool noodles?! Who else would've thought of that?! This is going to be a huge web hit. Watch out for thieving magazines! How'd you guys do the topper disc? Is that three pieces of wood sandwiched together with the edges sanded down? And how are all the top and bottom pieces actually attached to one another and to the column? I'm assuming there's a bunch of glue going on somewhere but I'm not quite understanding how you make all the vertical pieces stay together. A little scribbled exploded-view diagram of the whole stack would help! Beautiful and ingenious piece. 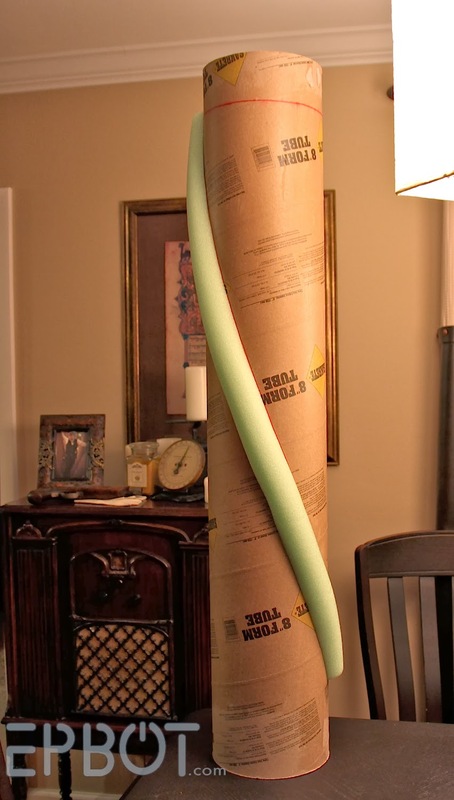 I'm pretty sure the tube just slides into the base, and the topper just slides over the tube with no glue needed to hold it all together because it's probably a perfect, snug fit. You'll just have to remember when you move it sometime in the future that it's three separate pieces. 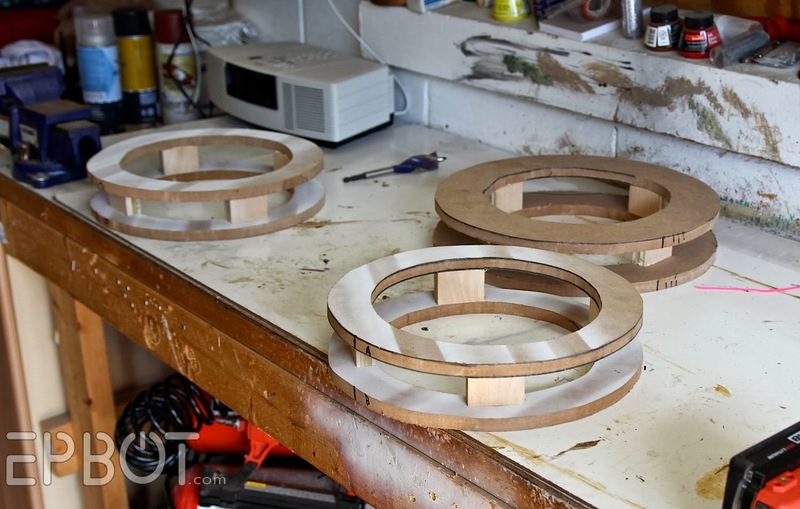 The square base and the bottom two rings are most likely screwed or nailed to each other, and the top disc is probably attached to the cap with a couple screws or nails driven from the inside top of the cap upwards into the bottom of the topper disk. Or, at least, that's how I would do it. Jen has already done plenty by posting what she has. The details are up to you. Sorry if I seemed rude; I didn't mean to. I know Jen said that asking questions was fine, and I know I asked a question. 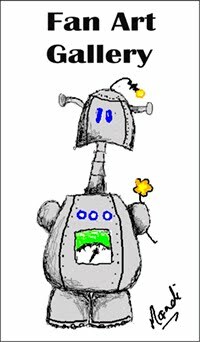 I just thought that asking her to draw up an exploded-view diagram was a bit much. But I shouldn't have said anything. My new year's resolution: Be a nicer person. I really am trying, heh. You've guessed pretty much all of it, KW, although both the top & bottom rings are held on with generous amounts of Liquid Nails, so we don't have to worry about accidentally pulling the top off. John put the Liquid Nails on the inside of each of the wooden support slats, so when he slid the cap on the glue would squish into place. And hey, you didn't seem rude at all Anony; I know I don't always cover everything with my tutorials, so I'm glad when folks ask for clarifications. Bring on the questions!! I.Love.This. Also appreciate the other commenter with the pipe insulation suggestion in case one wanted to make a smaller version of this. Wow. You guys never cease to amaze me. Love, love, love this whole project! Now that's using your noodle(s). Pool noodles? Pool noodles? That's crazy....crazy awesome. I think this will be blowing up Pinterest very soon. It looks great. Eat your heart out RH. -Melissa R.
At one point it totally looked like one of these marshmallow ropes! http://2.bp.blogspot.com/-Wy0p-5xQZwc/UWV3Ub5hJRI/AAAAAAAALxU/-p3fz7MIi1o/s1600/sprinklebakes+marshmallow+ropes+5.jpg hihihhi!! My thought exactly! Couldn't focus after that, all I could think was "Mmm...marshmallows"
You two really are masters of DIY! I can hardly believe you took something ugly like pool noodles and made what looks like a stone column! Bowing in reverence for your skills. I don't know how to express how completely impressed I am with your god-like DIY abilities! So very cool! Always a treat to see a new Epbot post. Makes my whole day a bit lighter. What Shelley in So. Illinois said! But I secretly think you wrote this just to get a chance to use rare words like "pool noodle half", "stick your pool noodles onto your tube"...which is a great thing to say and much more polite than "shove it up your ***", and of course the ever popular "nice noodle lip"...which is a polite thing to say, rings true as a sincere compliment, and "squeeze jam that last noodle" which is a great punch line for many jokes...or used at dinner with Grandma in the 1960's. 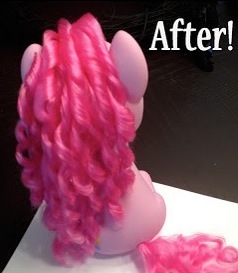 Hi Jen--what an amazing and unexpected use of pool noodles; well done. I'm writing because pool noodles always take me back to 1961, when our family first had noodles to play with. 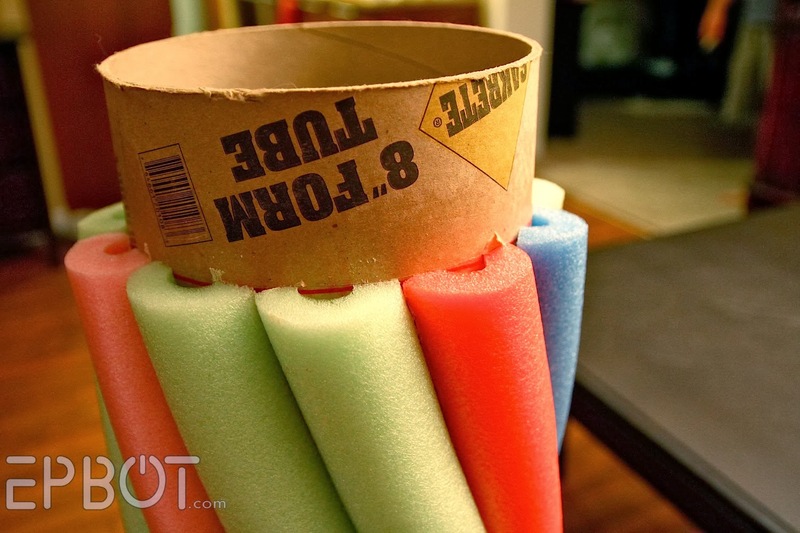 We didn't call them noodles; they had no name because Dow Chemical via my father--who helped develop polyethylene foam--had just extruded some different shapes and didn't know how to use them yet. We kids knew, and played with those and some 2 in. thick, 6 ft. long slabs in the waters of Higgins Lake in Mich. long LONG ago. My 92-year-old dad lives in an assisted-living facility now, and the noodles are used in their exercise program. My point is: you never know. I will show this column to my father; I think he'll get a huge kick out of it. Thanks again. So cool! 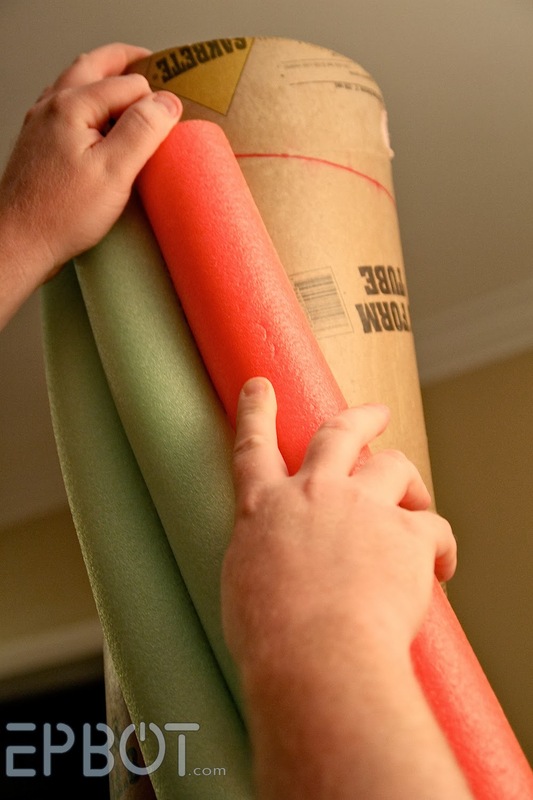 Thanks for posting this story, and please tell your pop thanks for the pool noodles and the foam mattress floats. Your family must have been a big hit with all the other kids who had never seen anything like that before. Oh yes. I was stunned when I first saw these in stores, and felt the need to explain to everyone that the noodles were NOT new! My mother cut up the slabs as the years went by for "sit-upons" when our Girl Scout trip sat outdoors. They were not cold or damp conductors, and much better than sit-upons made by weaving newspapers and covering the mat with oilcloth. 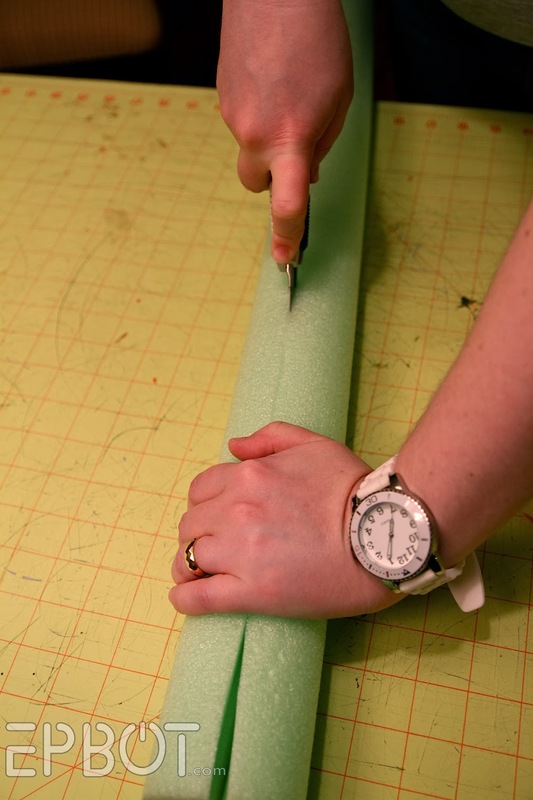 Another story we laughed about was when my father--part of finding a use for this foam--brought home a 4 in. slab, curved it with rope through the edges, and tried it as a pillow. Mom said that the "pillow" hit the floor in about 10 seconds as a failure. The first use they found was as buoyancy inserts for life-jackets. The foam was very lightweight, and didn't absorb water. I've learned this last bit as I've visited my dad frequently over the last 6 years. I'm glad he's lived long enough for me to learn more about his contributions in his career. That is seriously awesome, KathyM! I love how the 'net makes it such a small world after all - and I hope your dad gets a kick out of seeing his noodles find even more uses! I was just out to see him, Jen, and he looked through the photos with interest, to a huge kick out of it and agreed that he NEVER would have guessed the polyethylene foam would be used the way you did. Amazing as always. That's awesome! I work at an insulation distribution company and we carry Dow Chemical products. 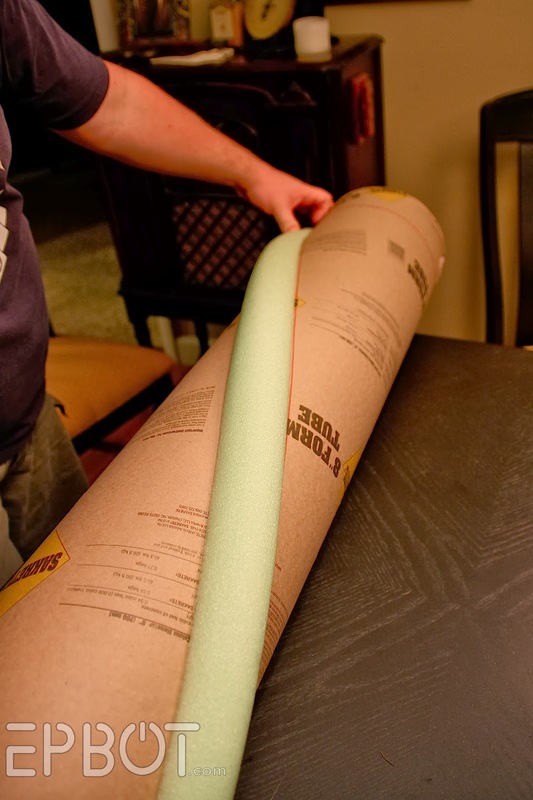 I've used various insulation products for quite a few "unintended for" uses. 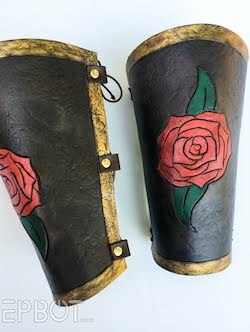 I think the prop and crafting worlds owe a lot to the companies that have developed these products, and those companies probably don't even know it. It does! And I just had some awesome Bodega Bay taffy for Christmas. :) Dangit....now I want some more! Very creative use of pool noodles! 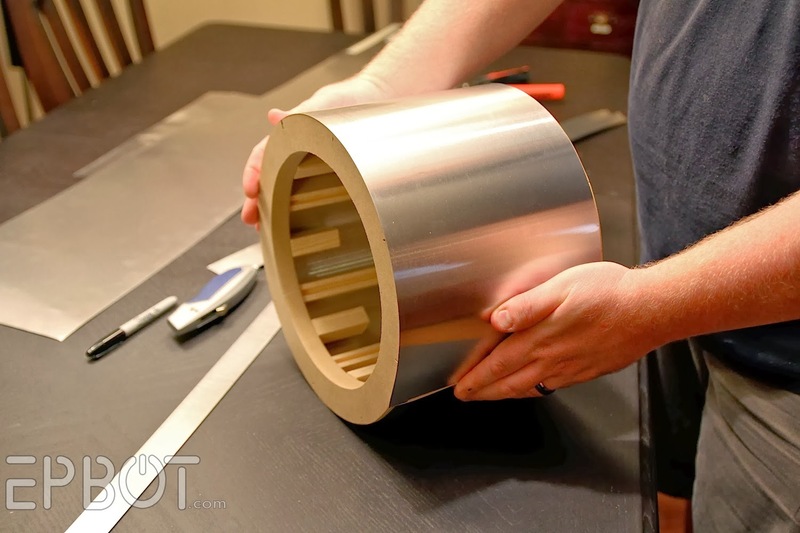 I agree with Caitlin that pipe insulation would work very well and make for a skinnier column. You know Jen, I have ALWAYS wanted a column next to my piano with a large Mozart bust on it. Thank you for offering an interesting, inexpensive, and creative method for achieving this. I could not afford $500/column, and my husband would balk at it. I can't wait to show this to him! 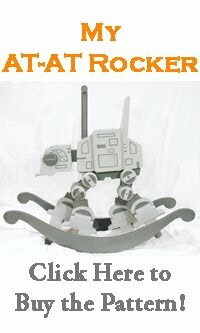 He is a very crafty type, and has the patience for these types of projects - so this may be a fun (and maybe frustrating!) way to bond with him. LOL! Super impressive, Jen! Love it! I'm sure you've heard it before, but you guys are freakin' genuises!!! 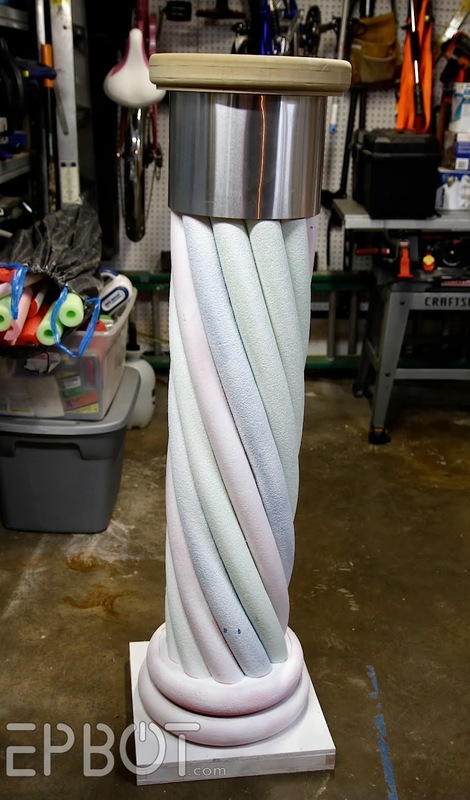 Who'd have thought pool noodles could look so dang cool? I'm going to do this someday when I have my own place to decorate. Thanks for continuing to share your creative genius with the world! I want you guys to come to Kentucky and redo my entire house! GEE NEE US! I am SO copying this! You two are just such inspirations! this is super creative! Color me impressed. See Jen, Now you have me already thinking of Halloween. I could have an entire haunted Greek ruin on my front lawn for like a hundred bucks! Or a mausoleum! Would really compliment my life-size cheese cloth and starch ghosts. Spectacularly envisioned and executed! I love the way you think. wow, I am always impressed when people can use imaginations to do things like that. I only see pool noodles. You can come spend some time here and I'm sure you can figure out things to do with my junk/stuff. That was so darn creative. I wish I could think out of the box like that. 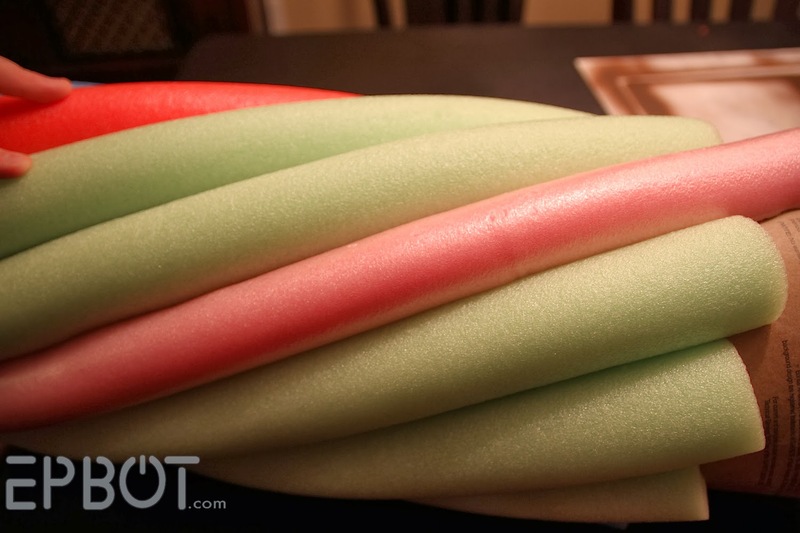 As the person above me said, I see pool noodles when I look at pool noodles. 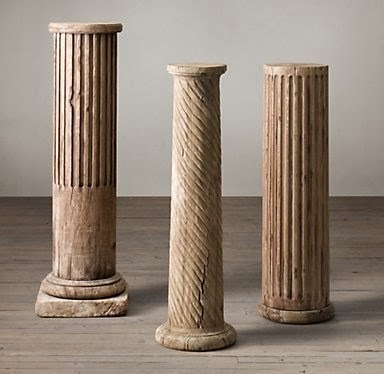 Not a column. This looks pretty sweet! Maybe I'll have room in my next place to do something like this. 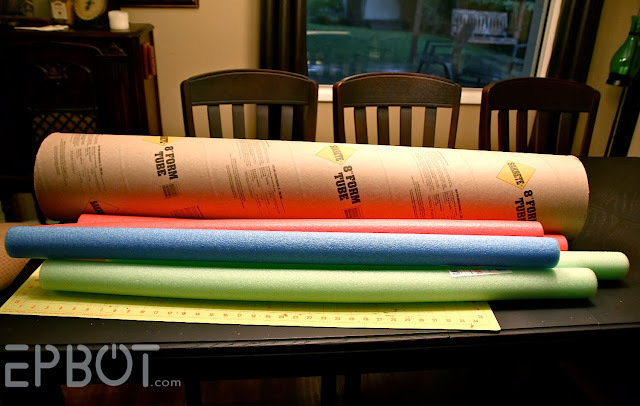 Will of course wait until fall when the pool noodles go on clearance again. 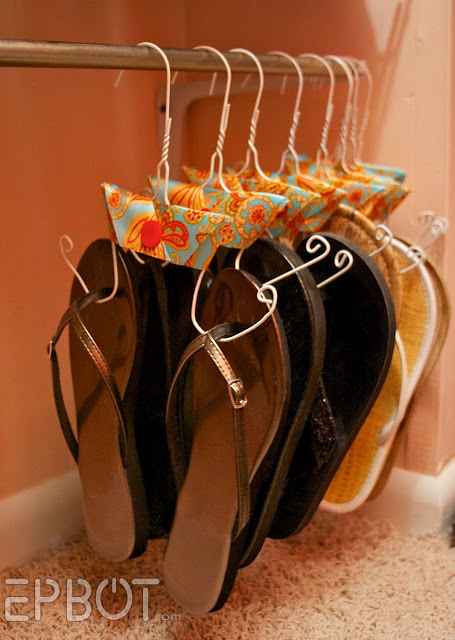 Thanks for sharing this cool idea with us. 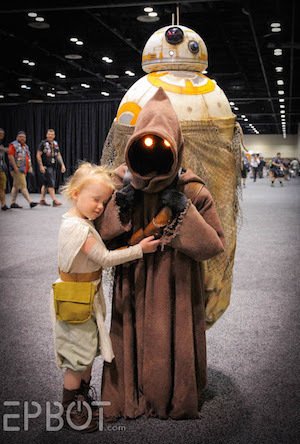 This is incredibly awesome and clever. I can see this getting pinned by a lot of theatre major/set designer types. What a great way to create a huge effect that could be easily moved around a stage and also be affordable on a small budget. 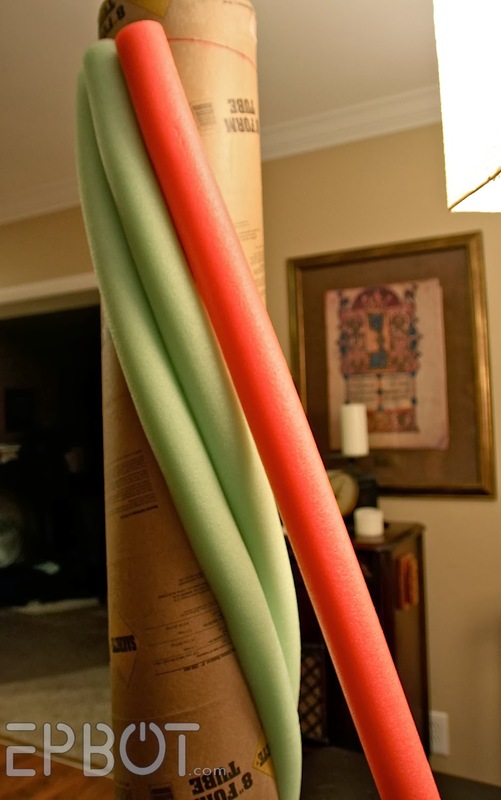 I think I'll invest in Pool Noodle Futures, since I see that there is going to be a rare mid-winter rush on them! You guys are amazing--even _thinking_ that I could make something like this is so completely out of my brain's capacity. That, and Nice Noodle Lip is my new rock band. 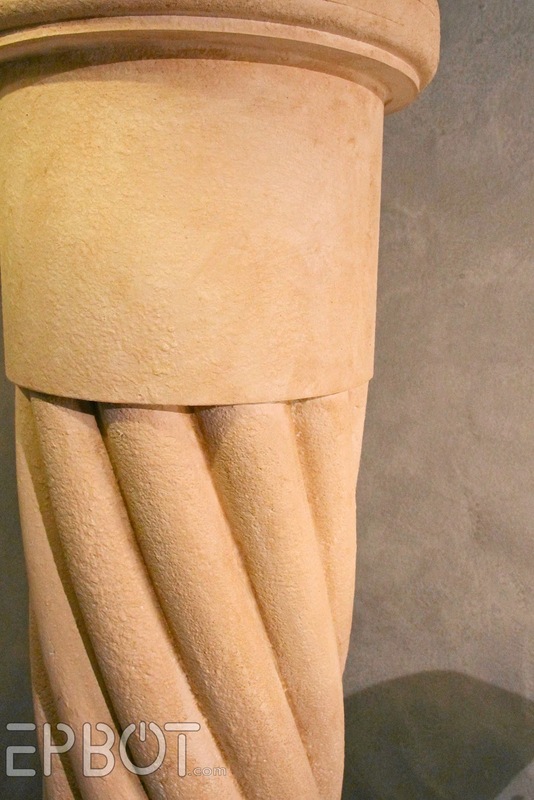 Well, now…this is going to come in handy next time I need to build the Parthenon for a play! OMG I need a few of these in my life! 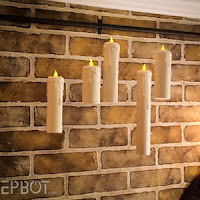 These will be awesome for photoshoots as well as just "look at my awesome decor". Lol! Thanks a ton for this tutorial! You guys are awesome. WOW!!! I LOVE IT! I have to try this, since Hurricane Katrina took all of the ones we had. They purchased at a very low price, but I had lots of FUN faux-finishing them in stone textures with hammered metal effects on the capitals. 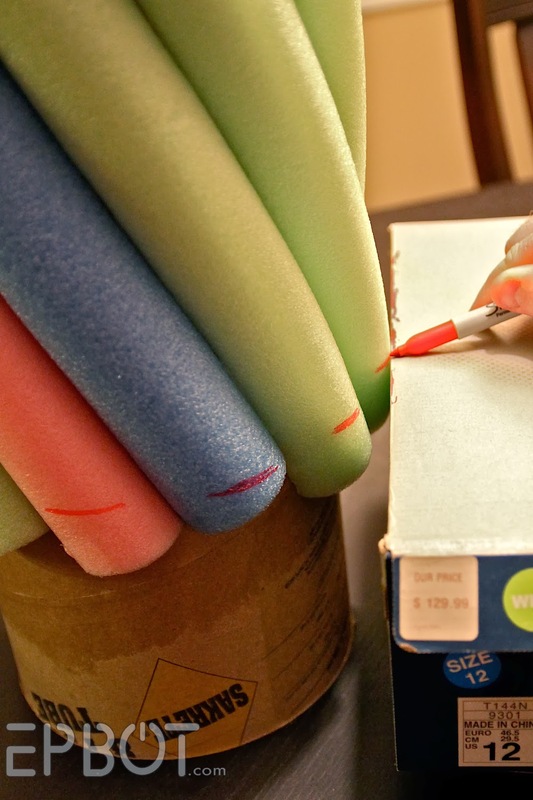 The pool noodle method will cost more than my originals, but still cheaper than buying new ones, even at the lowest of today's prices! Thanks for the brilliant tutorial! Mind blown!! Loving your site...thanks for all the creative cost-saving ideas. I'm a pretty handy gal...there are already 3, maybe 4, projects that I'm going to start working on when I get out of camp! The sliding barn door - perfect for my tiny master bathroom; the pendant lighting; the aged mirrors and now this...I'm going to be busy!! And I haven't even gone thru the other ideas. Please keep them coming! Your new crafty fan! Hands down one of the BEST projects I've seen in years! You rocked it! My daughter is getting married in a Masonic Temple and she wanted columns with Tuttle netting. Faux columns cost a fortune. This is perfect. I found 12' tubes, I need 2 8 foot columns and 2 five foot columns. I think I can make all 4 for less than 100. Will they hold up for wedding props? Should I weight them down with a concrete stone in bottom? 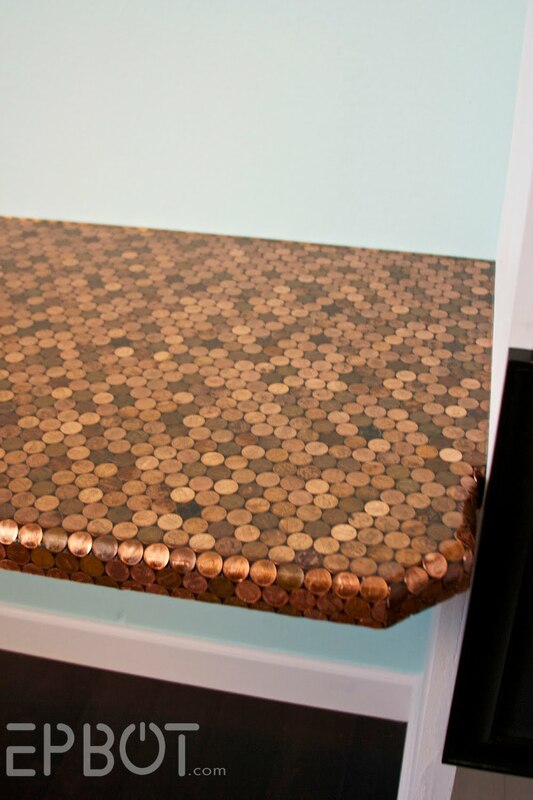 I *just* finished this project ten minutes ago myself after seeing this post a month ago. And. I. Am. In. Love. I love the way it looks and am just soooo proud that I made this. With. My. Own. Hands. I am so proud you don't understand. Haha. So thanks again down here in Texas. On the contact cement, it should only just be dry before you stick the two pieces together; I wouldn't wait *too* terribly long. And yes, it can still be a little tacky. The two coated pieces should immediately stick HARD - if not, there's definitely something wrong! I'm back! i have talked with a representative at DAP re: the contact cement and learned tons! can you tell me if you used flammable or non-flammable contact cement? thanks. The stuff we used is flammable - haven't even heard of non-flammable options! Hope it works for you this time! Hi Jen - tx for your quick response - i appreciate it! yes - the cement we have is non-flammable and the rep that i spoke with says the non-flammable is MUCH more finicky so i'm assuming that is some of our problem. i'm wondering if that may be controlled by our state?? also we need to be in a controlled environment in order for it to adhere properly - appx 70 degrees, less than 50% humidity, no sunlight, etc. and we were working in our garage late afternoon by of all days it was still over 80 degrees (and very humid). so we will try again! tx again! OMG I love this idea you guys are incredible. I will love to have some for my garden, how will they hold up out in the open? WOW! What an amazingly unique idea! Glad we could make an appearance on top! Are you also putting contact cement on the inside of the noodle before sticking it on to the column? Yes, with contact cement you coat both pieces of whatever you're sticking together. Great idea! Much lighter and less expensive than the ones sold in the stores. I have a question. 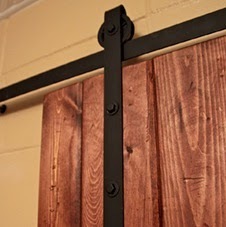 I am looking to make something similar, but wanted to know when using the primer, does the color still show through after one coat? If not, would any other primer be recommended so some of the color shows through? 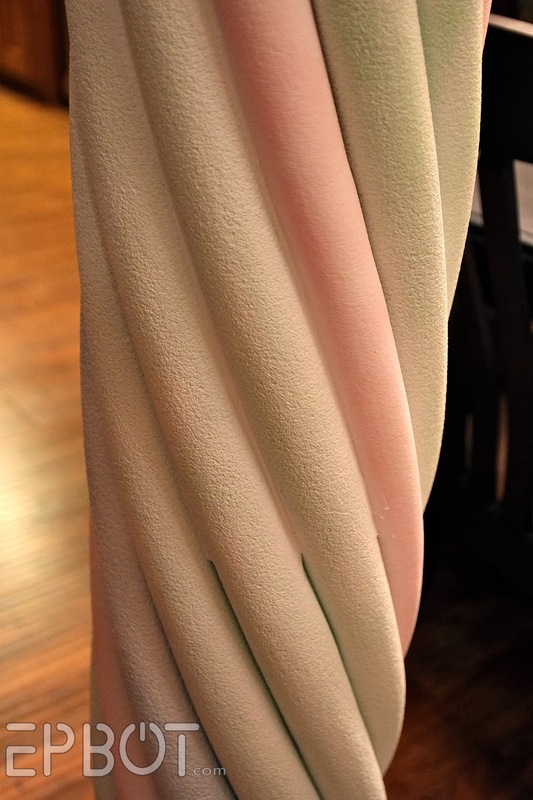 I am looking to make this to look like the pastel marshmallows, so I want some of the color to show through as they are pretty bright now. Your input would be most appreciated. Thanks! Yes, most primers are quite thin, so you should have the same see-through effect after just one coat. To keep it even, I'd use a spray-primer; otherwise anywhere you overlap with a brush-on coat will be darker. Good luck! Yes, I am that one person is gonna ask that one question, and I now the answer is right in front o me!!! 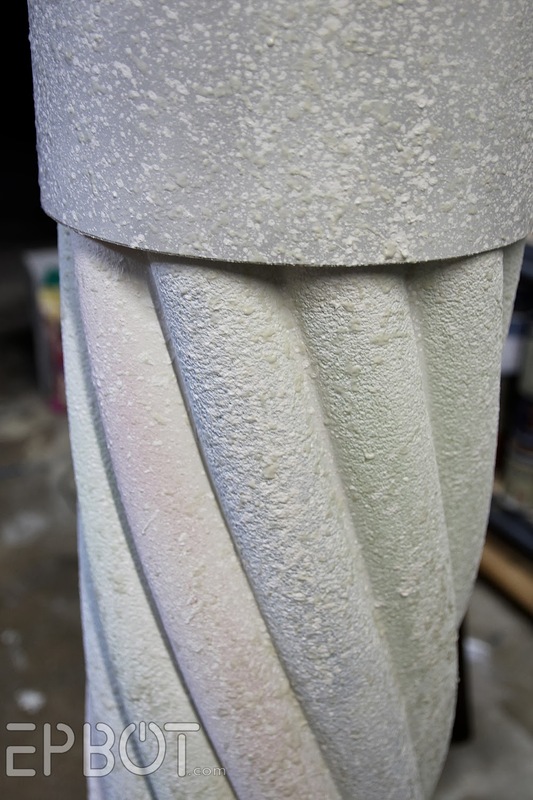 You put two coats of the cement glue on the edges of the noodles and the column let it dry!! Then you start putting the noodles around the column, how does the noodles stay on the column?? I am soooo confuse!! Thank you and be gentle on me!! Don't worry, Patricia, that's actually how contact cement works: you apply it to both things you're gluing, let it dry, and THEN stick the things together. The glue will only stick to itself, which is pretty awesome. Once you try it you'll find you use it for all kinds of things! Bloody brilliant......I will be trying this for the haunted house.